Remember when Apple made printers? Yes, printers. Apple once produced—and was quite famous for—its own printer line that worked well with its computers. This may come as a surprise to newer members of the Apple community, especially in light of a modern Apple corporate ethos that often fetishizes the glossy and the cutting edge. In a world of iPods and iPhones, flat-panel all-in-one Macs and sleek laptops, machines that squirt ink on dead trees seem like the last thing Jobs and Co. would be interested in. Apple printers stake out a significant portion of the company’s history that many often overlook. To rectify that, let’s begin a new era of Apple printer appreciation with an analysis of the history’s five most important Apple printers. While reading through this, keep in mind that these printers aren’t necessarily the best or highest selling models—they’re the ones that had the most impact and influence over time. Why it’s important: The LaserWriter 8500 is much more important symbolically than technologically: as the last printer Apple introduced, it marked the end of a long line of technical excellence in Apple printers. It also marked the end of a famous brand that revolutionized publishing. Apple endured a famously bad financial first half of the 1990s, and while cleaning house around 1997, Apple decided that printers weren’t part of its core business. Apple downsized its printer division and ceased work on new printers, but still produced a few models—like the 8500—until 1999. By that time, printers had become a cutthroat business with low profit margins, and universal standards like USB and Ethernet (both supported by Apple in 1998) obviated the need for Apple to provide specialized printers to interface with the Macintosh’s unique LocalTalk port or to operate on an exclusively AppleTalk network. The LaserWriter 8500 itself was a beast of a machine; as a 600-dpi workgroup printer, Apple designed it to handle multiple paper sizes and a heavy workload (20 pages per minute). Its translucent-green accents foreshadowed the radical design revolution Apple’s products would undergo the following year, making it the closest thing to an “iPrinter” you’ll ever find. Why it’s important: In the early 1990s, inkjet printers like the StyleWriter quickly overtook dot-matrix printers in the low-end consumer printer market due to their low noise, low price, and ability to print almost laser-quality graphics on plain sheets of fancy-looking cut paper (no more tractor feed!). While not necessarily the most reliable or durable of the StyleWriter line, the original StyleWriter stands out for being Apple’s first inkjet printer. With a price of $599 and the ability to print at 360 DPI, the StyleWriter was Apple’s first printer to make printing high-quality graphics affordable for Mac users. The StyleWriter, based on a Canon Bubblejet print engine, marked the beginning of a new line of low-cost Apple consumer printers that would continue for the next six years. Why it’s important: At the time of the Silentype’s announcement in 1979, the Apple II had already begun its wild ascent to the pinnacle of the personal computer marketplace. This was in large part thanks to VisiCalc, the world’s first PC spreadsheet application. 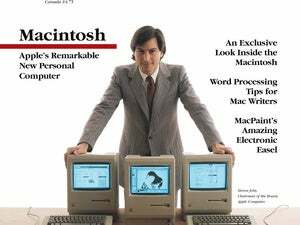 With VisiCalc came a new respectability for Apple’s “hobby machine” among small businesses, and Apple soon realized it needed a printer to match. 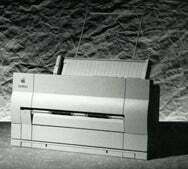 In retrospect, Apple’s first printer seems like an underwhelming effort. The Silentype printed on special heat-sensitive paper that darkened when heated. 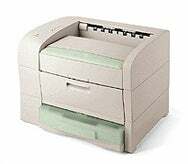 This made the printer smaller, quieter, and even less expensive than most printers on the market, which typically used the dot matrix printing technique. However, this technology (commonly used for receipts today) is notoriously impermanent, making it a poor choice for serious hard copy use. Aside from being Apple’s first printer, the Silentype is perhaps most important because of the precedent it set. When Apple needed a printer, it didn’t say, “Here, Woz, design us an amazing new printer that only uses 3 parts.” Apple looked outside the company for an engineering solution, perhaps even for the first time. Apple ultimately chose the Trendcom Model 200 as the basis for the Silentype, which was nearly identical to Apple’s model aside from a “Silentype” badge and custom interface hardware designed by Apple engineers. From then on, Apple would always base its printers on technology from other companies, choosing to incorporate existing printer engines (like those from Canon or HP), or to simply rebrand an existing model with an Apple name. Why it’s important: In 1984, Apple introduced a dot matrix printer, the ImageWriter, designed specifically to complement its new Macintosh computer. While Apple repurposed the first ImageWriter design from C. Itoh Enterprises, it still contained custom Apple-made firmware that worked with the Macintosh to allow WYSIWYG-like graphical printing capabilities, which couldn’t be found in other printers at the time. Apple produced the ImageWriter out of necessity—if it didn’t produce a special printer that worked well with its new system, who would? A year later, Apple revised the ImageWriter design as the ImageWriter II, a faster, sturdier printer that reimagined the ImageWriter’s dull, boxy case as a sleek new peripheral rendered in the company’s “Snow White” design language. While still based on C. Itoh internals, the ImageWriter II incorporated some of the most extensive Apple engineering of any Apple printer. The ImageWriter II was capable, durable, relatively cheap, and popular. It sold well, and Apple continued producing it until 1996—that’s more than a decade—making it Apple’s longest-selling product of all time. 1985 was a heck of a year for personal computers. In that year, Apple combined its Macintosh, which supported WYSIWYG graphical design on screen with proportional fonts; Adobe PostScript, a page description language that made fonts and page layouts smooth and sharp at any size; and the laser printer, a machine that could print high resolution text and graphics on plain paper, into a perfect storm of small-office empowerment and productivity. When Aldus released Pagemaker 1.0 for the Mac later in the year, it was all over. The desktop publishing revolution had begun. None of it would have happened without the Apple LaserWriter, the world’s first PostScript printer. Apple’s printer began a long line of proud LaserWriters that extended until the end of the company’s involvement in the printer market in 1999. If for no other reason, Apple should be extremely proud of its legacy in printer history due to this one machine—a machine that came along at a perfect moment in history and, in combination with those elements listed above, catalyzed a revolution in the way people design and produce symbols on paper. Is it time for a new Apple printer? Or is paper so dead and so uncool in the eyes of Apple’s management that even if Apple could once again contribute to printer engineering, it wouldn’t even try? In the face of everything becoming ever more digital and paperless, it may seem unlikely that we’ll ever see another printer sporting the famous Apple logo. But know this: In the long varied history of Apple, far stranger things have happened.